These amazing pieces of heaven fit neatly into one of our funky zinc pots, on a bed of shredded tissue, wrapped in cello and finished with red ribbon. Perfect to pass around, but save some for yourself! 4 x Milk Chocolate Mallow Teacakes 24g - with a delightful biscuit base that's topped with fluffy, soft dreamy marshmallow and then coated with milk chocolate how can anyone resist?! 2 x Cupcakes - a mouth-wateringly delicious selection of 2 assorted cupcakes finished with a sensational swirl of icing and sprinkles. 2 x Giant Double Choc Chunk Chip Cookies 90g. From the quirky Snak Shed, there's the bigger than most doubly delicious Double Choc Chunk Chip Cookies! With really chunky pieces of chocolate there's a double chocolate delight in every bite! 4 x Brilliant Brownie Squares 70g - wonderfully chunky and luxuriously rich! Milk and dark Belgian chocolate mixed with a little magic these chocolate chip brownies are not only indulgent, but a piece of pure heaven! A Brownie that any girl guide would be proud of! Gluten Free. Suitable for Vegetarians. 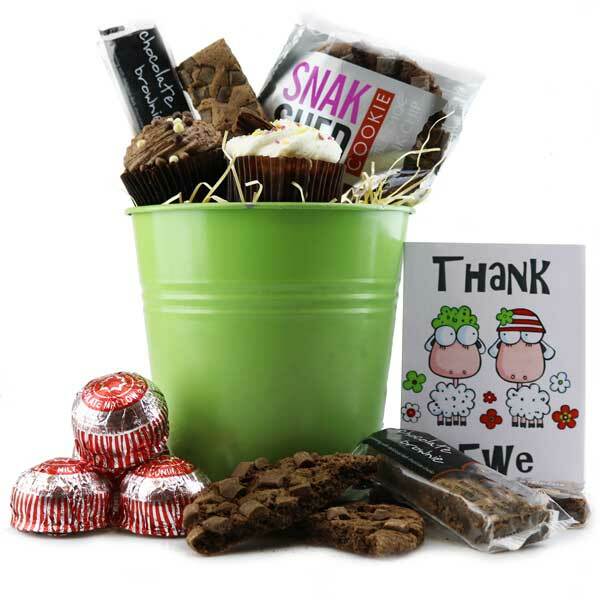 A thank you gift, or good luck gift, or even maybe a congratulations gift!